If this is a vision of dying, it is a reassuringly rowdy affair, more bar-room brawl than somber wake. The corpse lies all around, its skeleton slowly decaying and it is difficult to reanimate her in your imagination from the scattered ribs that remain. Rowdy rabbles swarm around, and every so often, soundless scuffles break out between the factions, as they push and shove for prime parts of this carcass. It’s a dynamic dying this, and after more than a century, the process of transforming dust to dust continues unabated. Our being here is a violation surely, another sacred space invaded in the increasing commodification of voyeuristic experience, and if I am not entirely uncomfortable with being part of this grave-diving party, it is because we are not the first ones here. 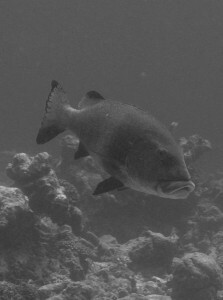 The giant sweetlips, motionless above the drop-off gives us a patient, tired look as we disturb his hunting ground. There is a quiet disdain in his assessment: with lycra skins, plastic fins, silicone eyes and artificial respirators, we are more synthetic than organic, and rather inelegant aliens in his silent universe. I guess he knows from experience that if he tolerates our presence another hour, either our weak physiologies or our primitive technologies will force us to surface leaving the busy shipwreck to get on with the long, elaborate business of decay. And as you surface, you look back once more at the wreck below. From out in the blue the ship is a laceration on the face of the reef, a deep gash that starts at 17 meters and continues until it meets the breakers at the surface. The island of Minicoy has several such wounds on her reef face – steam ships that ran aground on trans-Indic voyages, carrying grain and cotton and spices and travellers between Europe and the Indies. 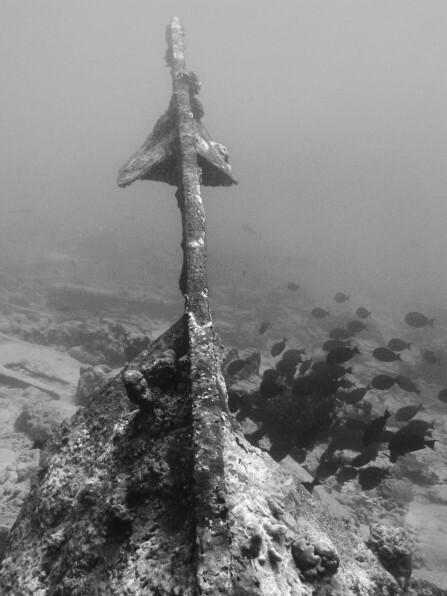 After 1885 the wrecks are less frequent after a lighthouse was erected on the southern tip of the island. The lighthouse is manned still; the lighthouse keeper is a gentleman in the old manner – a self-styled naturalist, a collector of flotsam, keenly aware of the historical symbolism of his post, a proud custodian of his craft. He accompanies us up the winding iron staircase of the lighthouse, and from this height you can just about make out where the wrecks of old wounded the reef before this tower was built. Wounds heal. After the grinding crush of iron keel on aragonite coral, after the life rafts are deployed and the passengers rescued, after the cargo holds are salvaged and the ship stripped of every useable part, the reef calls on its resources to try, as best it can, to repair the tear in its ecological skin. The fish are the first to venture back, and for species that thrive on structure, a fresh wreck can be choice real estate. The benthos takes a little longer. Coralline algae will eventually cover the metal remains, and where there is coralline algae, coral is not far behind. Slowly, the aragonite will grow back again, and although the scars will always show, the reef does its best to embrace the alien structure and make it part of its own complex framework. Given enough time, the wreck is little more than a cicatrix on the bark of the reef, a mild blemish of rusting metal and flourishing coral. The reef is good at mending bruises. From its pre-Cambrian origins, it has spent most of its existence on a turbulent earth, shifting and gurgling with earthquakes and tsunamis, storms and high waves, extreme tides and shifts in temperature. And by now the threats of ocean warming and El Niño events on coral reefs are familiar tropes to a media-suffused populace. We have all seen, and are perhaps even a little weary of those dramatic images of bleaching coral and dying reefs. When a small disturbance scales up to catastrophe like this, the self-healing capacities of the reef are put seriously to test. Yet even here, a healthy reef can recover. Much is dependent on having good neighbours close at hand. If a few of these reefs escaped the big catastrophe, they can seed the bare spaces with coral. Like white blood cells to the site of a lesion, a flood of coral spat will descend on the spot made dead and vacant by the disturbance, and occupy every free space. And if the reefs still have a fair complement of grazing herbivores – surgeonfish, parrotfish and the like – those opportunistic algae that can quickly bully out the coral will be kept under check. Given a period of relative calm, and this spat will quickly grow, engaging in a serious-as-death struggle with its compatriots for a space in the sun. Within a decade or so, the wound is mended. Even in a healthy reef, scars remain long after the healing. Some species of fish and coral may never recolonize a reef if their populations fail. These absences often go completely unrecorded, because we often have no baselines to help us determine the loss. The species that remain have strange demographies, dominated by young individuals, or with some ages completely missing from the population. These populations, like some post-war generation of lost young soldiers, will carry the signature of this loss for a long time after the disturbance has gone. Back down in the reefs of the Minicoy you can read this signature everywhere. Minicoy bears the burden of its isolation heavily when hit by large disturbances. The once effulgent abundances of branching Acropora are there no longer, and you suspect (although you have no way of knowing) that many of the genus are probably locally extinct. 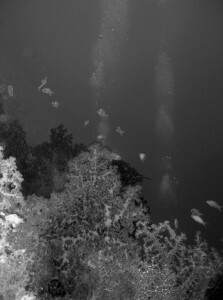 The coral that remain are either very large – survivors of the last mass bleaching – or very small – individuals that managed to recruit to the reef after the event. As you descend to the wreck for one last time, you realise, that viewed in one way, the scornful dismal of the sweetlips on your previous visit, was actually a fair metaphor for the wreck itself. Much like you, the wreck is a bionic entity – and after all these years, the identities blur between human and natural forging. This is not new of course. The ability of coral to take human structures and make them its own is well known. And it does not take long for us to wonder if this ability can be used to help reefs in the process of wound healing – hurry along a repair that would otherwise take decades. It is a neat idea surely, and it appeals to the engineers in us. We are a meddling lot, and it is difficult to leave well-enough alone. 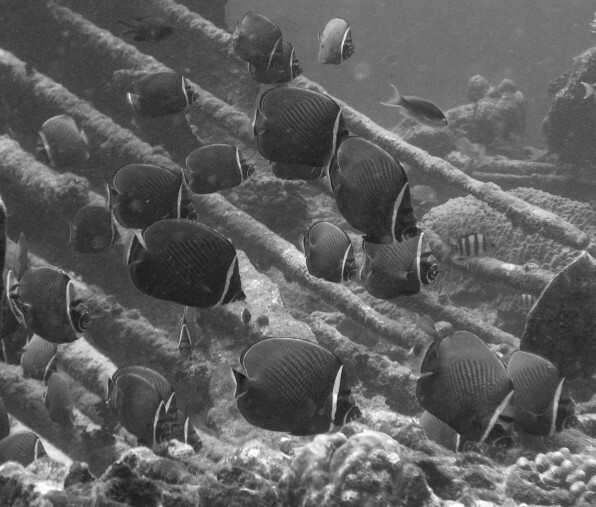 Already, on experimental and larger scales, there are efforts afoot to restore reefs through artificial means, using many of the same techniques the reef uses when dealing with a shipwreck. Concrete blocks of different configurations are being cemented to the reef, waiting for recruits of coral to descend. Complex electrified contraptions are being established, with the purported aim of encouraging calcium deposition. For many, even these relatively passive means are not fast enough. Nurseries of coral are being constructed, where coral from the reef is broken into bits and coaxed to grow into individual heads. These will later be taken and cemented to the reef, to produce, in the reasoning of the coral nurserymen, instant reefs. If I come across as a tad sceptical, it is not because I do not believe that these techniques of engineering reefs are a solution. What I am not entirely sure about is what problem they are a solution for. The dilemmas the reef face today from local and global pressures are complex ecological dilemmas, and trying to solve them with simple – dare I say, simplistic – engineering solutions is appealing surely, but almost certainly blinkered. If it is our meddling that has brought reefs to the current brink of disaster, it is a vain presumption to believe that all it will take is a little more meddling to right those wrongs. More seriously for me, it appears to absolve us of deeper responsibilities – to understand the underlying processes that drive the reef’s immune system in the face of disturbance and catastrophe, and to ensure that these processes are protected. This takes more imagination of course. It requires a certain humility to recognise the boundaries of our own accomplishments. And it requires an intellectual investment beyond cement and epoxy. In the absence of this knowledge, the future for reefs is uncertain. We are traveling without a lighthouse here, and shallow strands are everywhere. A version of this post first appeared on the NDTV blog site. Its always a pleasure to read your articles. This yet another lovely piece. A reminder of the fact that we cannot think of restoration as an excuse for meddling with and most times ‘tipping over’ complex structures created over millions of years of evolution. In recent times one hears overtly optimistic pronouncements over what science can do to restore ecosystems. By no means these arguments should be used to justify the developmental juggernaut. This is light on a world we know so little of. Thank you!